The Original Multi-Sensor Inspection Providers. 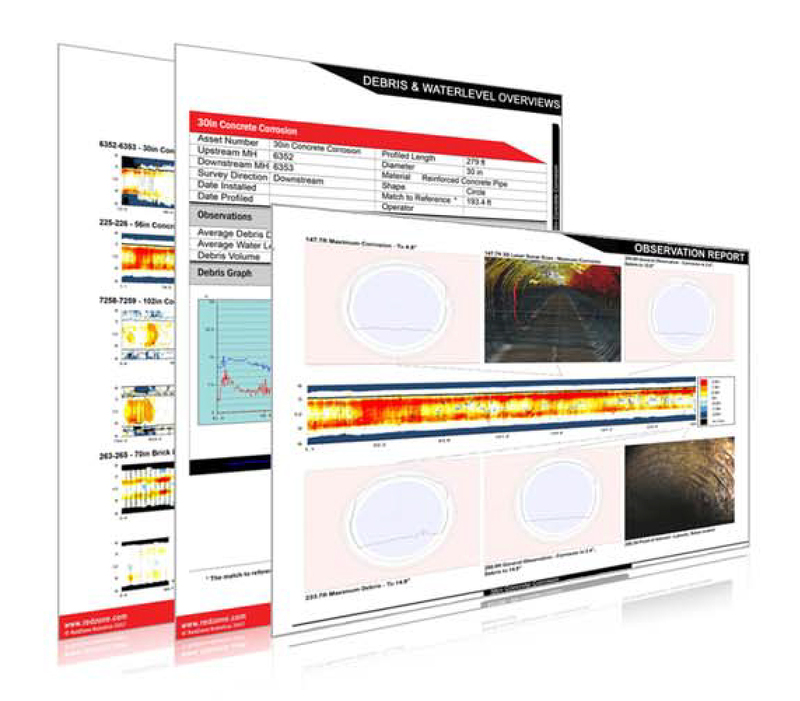 RedZone pioneered the industry with a suite of multi-sensor inspection (MSI) assessment equipment designed for large interceptors and tunnels. MSI data quantifies and identifies critical problems such as corrosion, deformation and debris levels, that can be missed by visual-only CCTV inspection. With infrastructure aging around the world wastewater engineers are required to maintain a constant understanding of their network. Through the use of Lasers/Lidar sensors, accurate empirical data on the wall loss or deformation within their buried assets can be ascertained. No longer will the subjectivity of CCTV images mean considerable expenditure based on an operator’s judgment of the severity of defects. Laser data is collected with synchronized sonar information beneath the flow. Sonar readings provide the volume and location of debris within the network, data vital in creating a targeted cost effective cleaning program. RedZone provides the quantitative analysis to make fact based decisions regarding the maintenance and rehabilitation of your buried infrastructure, our trained teams have over the past decade processed over 8 million feet of MSI information, providing a true and trusted independent assessment of the state of your network. RedZone MSI Reporting - RedZone’s reporting system is based upon the topographical flat graph, all of the data collected is then presented on the color coded representation of the pipeline from manhole to manhole, split and unrolled at 6 o’clock. On the flat graph Reds, Oranges and Yellows indicate where the data is outside the set pipe diameter (corrosion), where as Blue indicates points inside the reference (debris). RedZone Premium MSI Reporting - Decisions made by wastewater design engineers have critical impact on project costs, risk and overall success. Often these crucial decisions are based on outdated or inaccurate information. RedZone’s Responder system can provide the clarity and empirical data to mitigate these issues as by 3D scanning the pipes in question you know what you are dealing with underground. 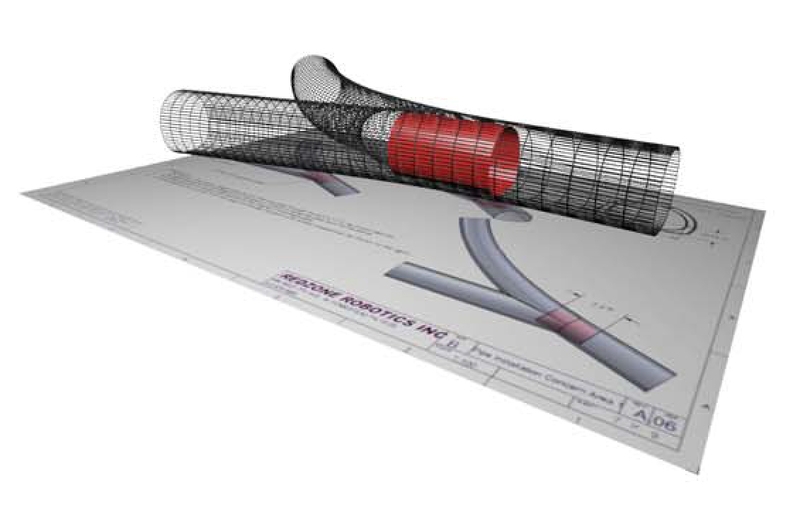 As-Built Models and Drawings - 3D models of pipeline and chamber locations, results can be provided in a variety of formats, along with dimensional drawings. Alignment - Coupling bend radius information with known GPS co-ordinates the report shows the pipe’s center line and manholes in real world positioning. Bend Geometry - Identifies bend radius/curvature to show location and alignment deflection angle of each bend in the pipeline. Also identifies geometry size and shape changes. Virtual Mandrel - Virtually test the viability of different lining parameters, providing information on clearance and liner-liner deflection angles.